with a special prosecutor because they accused Jimmy Carter sitting president of making money from his Peanut farm that Carter built himself after getting out of the military. They claimed his peanuts were selling for a high price at from his warehouse? But Carter had put his assets including the peanut farm in a blind trust and he had no dealings with it. They also accused him of his brother profiting from sales of Billy Beer. President Trump was dealt a major legal setback after a federal judge allows an emolument lawsuit against him to proceed. David Cay Johnston explains what comes next in a court case that could have bigger implications for Trump than the Mueller investigation. A federal judge has rejected President Trump’s efforts to stop a lawsuit alleging he violated the constitution’s emoluments clause by continuing to do business with foreign governments. DC Attorney General Karl Racine, who brought the case, tells Ali Velshi what’s next. The Donald used the tax laws to his advantage, just as every rich person from Bill Gates to Warren Buffett does and just as EVERY smart taxpayer does. THAT'S WHAT TAX LAWS ARE FOR ... to define what we can and can't do regarding our taxes. Anyone who doesn't scrutinize his tax situation vs the law to minimize his payments to a wasteful government is foolish. EVEN IF AN INDIVIDUAL WANTS TO GIVE MORE THAN REQUIRED, his extra money is FAR better donated to any of thousands of carefully chosen, MUCH more efficient, charities or causes. Definition of a political witch hunt: identify a target you hate, then put him under a microscope in the hopes he farted in public, used the N word 40 years ago, or spat on a sidewalk. Consider the VALID questioning of Obama's citizenship years ago, by Trump and by millions of others. No one on the left seemed to care that that was a LEGITIMATE concern at the time, or that if he was NOT a citizen, he'd have to withdraw his candidacy or vacate the White House. David Fahrenthold, political reporter for The Washington Post, talks about the challenging of finding out what foreign governments are spending money at Trump properties. another state files and judge rules in their favor for discovery..
IE trumps tax returns will be public. Maryland Attorney general Brain Frosh sits down with Chuck to discuss his lawsuit against Trump that bars him from profiting off his properties. 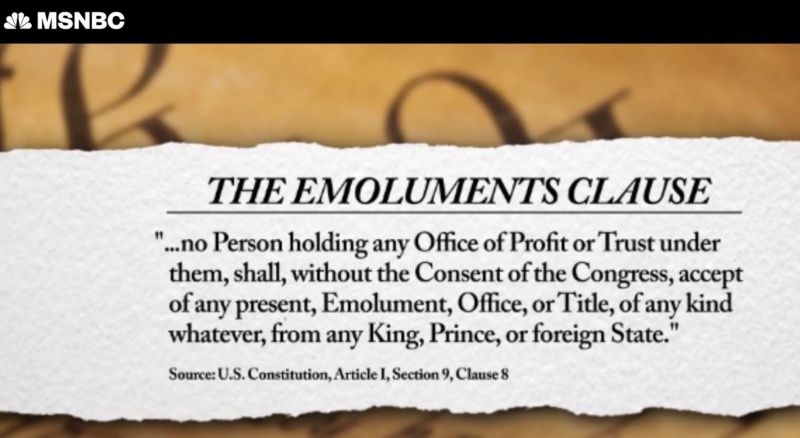 Let's look at a few Trump facts, which illustrate why there is an emoluments clause. Let's look at the ZTE scandal. STE was caught violating international sanctions on Iran. When the Department of Commerce imposed large penalties on ZTE that threatened to blow the firm up, the law firm of Hogan Lovells convinced Trump to lift those sanctions and a settlement was reached. But just before that settlement, the Chinese government agreed to $500 million in loans--to a project in Indonesia that included Trump-branded hotels and golf courses. How much did the Trump companies make? Unless Mueller sub-poenas his tax records, we will never know. Like Bill Maher noted, "Drain the swamp? More like swamp the drain." The most corrupt administration in history. Ain't working. Truth is not a diversion. What passes for logic in the weird world where fans of dishonest strong men have to ask themselves every day, "How do I defend the latest crimes of the criminal conspiracy that has hijacked democracy? So today's answer is that the bias of one FBI agent is of more import than the millions that the Trump family makes in violating the constitution. Absurd. "the bias of one FBI agent", trying to change the language again? "one FBI agent", that's no different than "anti-immigrant" as opposed to anti-illegal immigrant. Keep trying to change the language, you'll get called on it every time.